Looking for a new, exciting fragrance, I once again visited one of my favourite perfumeries, the Parfümerie Brückner in Munich. As always, I was warmly welcomed and touchingly looked after in Munich’s oldest perfumery. I smelled myself through novelties and well-known things, always looking for a new fragrance experience, for new pictures, for a nuance that I didn’t know before or perhaps didn’t notice when I first smelt it. However, I probably already had something in my head that didn’t really want to coincide with all the scents, because I didn’t really find it. 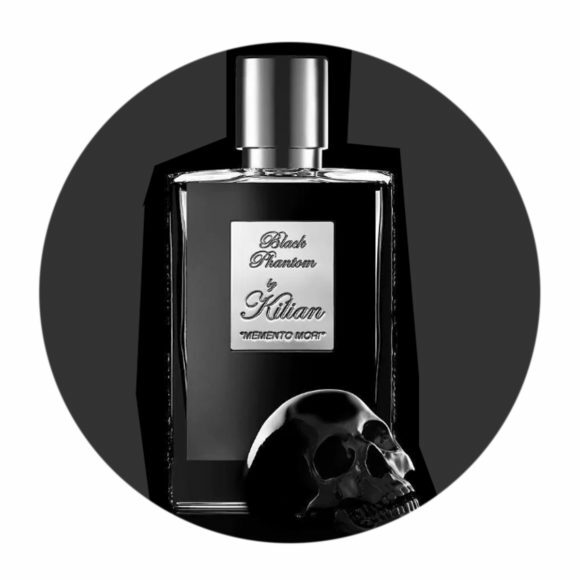 An extremely nice advisor, who diligently went to my hand, seemed to understand more and more what I was looking for and showed me the scent Black Phantom by Kilian. The first, pure sight drove me fear into my face and released very strong reactance with me. The box in which the fragrance is packaged is adorned with a huge skull and crossbones and is more reminiscent of Philipp Plein than of a dignified fragrance. Now PP is not exactly known for style and class, nothing the less my consultant remained persistent. I do not want to be deterred by the box, because what it would contain would be a fantastic journey into another world. The first impulse was caramel mixed with a hint of rum and coffee. Each note on its own already wonderful in its combination but stunning in its entirety. The vetiver and the sandalwood can only be smelled a while later, but the top notes complement each other perfectly. After the second smell I found myself on an old sailing ship in the middle of the ocean again. My crew was still asleep, the sea was smooth and calm. I stroked my long beard and stood at the railing, blinking into the sun and looking at the open sea. In my hand I held a cup of fresh coffee, which I had added with a shot of rum. I knew that the English fleets were on our heels and that we would fight the final battle today. Even though death is the constant companion of us pirates, I felt good, strong and invincible. For this reason we live this here and now as intensely as possible. I had to have this scent. It was outstanding, big and complete in its composition. Warm and yet not overblown. This feeling of strength, of life, of addiction to more! Black Phantom is certainly not a fragrance for everyone. But not every man is born to be a captain either. Auf der Suche nach einem neuen, aufregenden Duft begab ich mich einmal mehr in eine meine Lieblingsparfümerien, die Parfümerie Brückner in München. Wie immer wurde ich in Münchens ältester Parfümerie sehr herzlich empfangen und rührend betreut. Ich roch mich durch Neuheiten und Altbekanntes, immer auf der Suche nach einem neuen Dufterlebnis, nach neuen Bildern, nach einer Nuance, die ich bislang nicht kannte oder vielleicht beim ersten Riechen nicht wahrgenommen habe. Allerdings hatte ich wohl schon etwas im Kopf, was sich nicht so recht decken wollte mit all den Düften, denn ich wurde nicht wirklich fündig. Ein äußerst netter Berater, der mir emsig zu Hand ging, schien immer mehr zu verstehen was ich suchte und zeigte mir den Duft Black Phantom by Kilian. Der erste, pure Anblick trieb mir ein wenig die Angst in mein Gesicht und löste sehr starke Reaktanz bei mir aus. Die Schatulle, in der der Duft verpackt ist, ziert ein riesiger Totenkopf und erinnert eher an Philipp Plein als an einen gediegenen Duft. Nun ist PP nicht gerade für Stil und Klasse bekannt, nichts desto weniger blieb mein Berater beharrlich. Ich möge mich nicht von der Box abschrecken lassen, denn was sie enthielte wäre eine phantastische Reise in eine andere Welt. Der erste Impuls war Karamell gemischt mit einem Hauch Rum und Kaffee. Jede Note für sich allein schon wundervoll in ihrer Kombination aber umwerfend in der Gesamtheit. Das Vetiver und das Sandelholz riecht man erst eine ganze Weile später, ergänzen die Kopfnoten aber perfekt. Ich fand mich nach dem zweiten Riechen auf einem alten Segelschiff wieder inmitten des weiten Ozeans. Meine Crew schlief noch, das Meer war glatt und ruhig. Ich strich mir meinen langen Bart zurecht und stand an der Reling, blinzelte in die Sonne und blickte auf das offene Meer. In der Hand hielt ich einen Becher mit frischem Kaffee, den ich mit einem Schuss Rum versetzt hatte. Ich wusste, dass die englischen Flotten uns auf den Fersen waren und wir heute die finale Schlacht schlagen würden. Auch wenn der Tod der ständige Begleiter von uns Piraten ist, so fühlte ich mich gut, stark und unbesiegbar. Aus diesem Grund leben wir das hier und jetzt so intensiv wie möglich. Ich musste diesen Duft haben. Er war überragend, groß und vollständig in seiner Komposition. Warm und dennoch nicht schwülstig. Dieses Gefühl der Stärke, des Lebens, der Sucht nach mehr! Black Phantom ist mit Sicherheit kein Duft für Jedermann. Aber es ist auch nicht jeder Mann zum Captain geboren.